VideoCabaret‘s specialty is taking Canadian history — a subject most people consider dry and boring — and making it bleed. Told through sequences of short vignettes (most are 2-4 minutes long) and best described as real-life editorial cartoons, their Village of the Small Huts series is frank, visually-arresting, and a perfect antidote to Heritage Minutes. 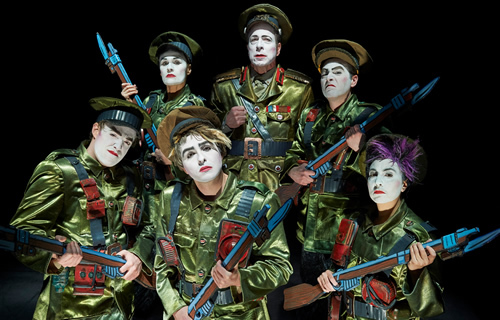 The Great War, part of their residential series at Soulpepper, plumbs the four years when Canada was rocked as never before, sending nearly 15% of our male population off to fight the First World War — and nearly blowing ourselves up in the process. And what makes VideoCabaret’s take so essential is how they explore not just the victories, and not just the losses, but what this experience can tell us about problems and struggles we’re still parsing today. VideoCabaret’s work is always centred around the actors, and The Great War is an ensemble piece: Mac Fyfe ran the table in last season’s Trudeau diptych, but the wartime setting (full of trenches and cabinet meetings and fuzzily-remembered evenings in low bars) lends itself to the whole cast pulling together. A prolonged scene where four brave young lads (led by Jacob James, his hair done up as a blonde ice cream sundae) repeatedly go over the top and engage the enemy is particularly striking, showing the real chaos and horror of trench warfare. But if there’s a standout performance, it’s Richard Alan Campbell, who does oodles of heavy lifting as solicitor-general Arthur Meighen, general Arthur Currie, and — most memorably — as then-ex-PM Wilfred Laurier. Currie is gruff and determined, well on his way to becoming one of the greatest Canadians; Meighen is knock-kneed and overly-earnest, about as unready to be Prime Minister as he’ll ever be; but it’s Laurier, sobbing quietly in the dark, that’ll really stick with me: so much of Canadian history begins (and ends) with this moment, and Campbell delivers it beautifully. As always, VideoCabaret’s visuals are stunning, and this production owes a lot of oomph to its well-staffed design team: Andrew Dollar (lighting), Astrid Janson (costumes), Melanie McNeill (costumes), Adam Barrett (projections), Brad Harley (props) and Alice Norton (wigs). My guest was especially taken by the quick changes and stark differences between the outfits, many of which are built of found materials. This show wouldn’t work if the performers couldn’t instantly conjure up a pleasant afternoon for golf, an evening in a bar in Armentières, or a body-strewn battlefield somewhere near Ypres, and the design team is what unlocks that vital element of nimbleness. Director Michael Hollingsworth (assisted by Deanne Taylor) keeps it cruising along at a snappy clip, not a wasted word between the important points. At times the show takes on a sort of Hall-of-Presidentsy vibe (“Whatever shall we do?” “Well I, [historical figure], have an idea!”), but this can’t be helped: how many of us would recognize the Duke of Connaught on sight? And the effect is less preachy, more vital: Hollingsworth’s script will shake the cobwebs off the information you learned in high school and promptly forgot, while introducing new ideas — and challenging your assumptions. It’s a fine way of teaching history, and if that means a few things have to wear nametags, so be it. The Great War, both on its own merits and as a component of VideoCabaret’s Village of the Small huts, is a definitive piece of Canadiana. If you have the slightest interest in Canadian history or public life, get your tickets now before they sell out. And if you know a thoughtful or political young person, you will not find a better introduction to one of the darker, but most important, components of the Canadian identity. The Great War plays through May 14th 2016 at the Young Centre for the Performing Arts, inside the Distillery District. Performance times vary, see website for calendar. Ticket prices vary from $36 to $56 depending upon performance. See website for details. Students with ID can purchase for $25 at any performance. Be aware that this production includes frank depictions of war and warfare (and related injuries), smoke and fog effects, sudden noises, and flashing lights. Although this venue is wheelchair-accessible, sightlines from the very front row (the only accessible zone) are not ideal. Cast photo by Michael Cooper.